Most of us have our guard up when it comes to direct-to-consumer drug advertising. We know the butterflies, sunsets and puppies in the TV ads are designed to distract us from words like “blood clot”, “heart attack”, “stroke”, “seizure”, “life-threatening allergic reaction” and “death.” We are aware that more than half the ads tells us why we don’t want to ask our doctor about the new wonder drug. Unbranded advertising, however, is much more insidious. Instead of selling a drug, it sells the disease driving the drug sales and sometimes doesn’t mention the drug at all. “You can’t see me because of radio… and I can’t see you because I’m totally blind.” So begins a high saturation radio campaign that launched late last year to boost “awareness” of an obscure circadian rhythm disorder called Non-24 Hour Sleep Wake Disorder in typical unbranded drug marketing fashion. How obscure is Non-24? There are only 146 citations for the disorder in the entire US National Library of Medicine. By comparison, there are 8,463 citations for the plague. The narrator says his blindness doesn’t “hold me back” but he often “struggles to keep up” because he is not “sleeping through the night.” He then says, “Sound familiar? You’re not alone!” The ads are from the Washington, DC-based drug company Vanda whose drug candidate for people who are blind and have Non-24, Hetlioz, received an FDA Advisory Committee recommendation for approval in January which means the FDA will likely approve it. Hetlioz is said to be chemically related to the sleeping pill marketed as Rozerem (Ramelteon). Of course the development of “orphan drugs” that treat such a small part of the population (like the blind) they are not commercially viable is laudable. But orphan drugs are not usually accompanied by multi-million dollar ad campaigns and slick websites. (Nor are important messages for the blind usually on the Web.) Is there something disingenuous going on? 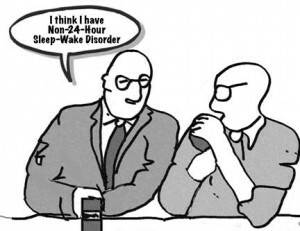 For example, under “Could You Have Non-24?” on the site, it says “The key symptoms of Non-24 are the inability to sleep or stay asleep and a powerful urge to sleep during the day” with no mention of blindness. A longer list on the site mentions waking up “groggy,” being “less productive than usual at work or at school,” relationships that “are strained,” “sluggishness and forgetfulness,” mood that is “affected” and frustration “because no one seems to understand what you’re going through,” and also doesn’t mention blindness. You don’t have to be a cynic to wonder if the new disease–and the drug that will treat it if approved– is actually being marketed to the hundreds of millions of adults with sleep problems. When I called the phone number and asked the “health educator” if I could have Non-24 even though I am not blind, I was told “you don’t have to be blind to have Non-24” though it is more common in blind people. When I asked if there was a pill I could take if I had symptoms, my educator said he was unable to answer that because, “I am not a doctor,” be promised to send me more information. Getting a pill approved by the FDA so it can be legally sold and then widening its apparent uses through ad campaigns is called off-label marketing and it is strictly illegal. Since the lab tests and clinical trials that would establish safety for a new condition haven’t been done, patients are guinea pigs. Almost all recent major settlements with drug companies revolve around off-label marketing of drugs including Johnson & Johnson’s Risperdal, Bristol-Myers Squibb’s Abilify, Eli Lilly’s Zyprexa, GlaxoSmithKline’s Paxil, Pfizer’s Neurontin, Bextra, Geodon and Lyrica, AstraZeneca’s Seroquel, Ortho-McNeil-Janssen’s Topamax, Forest Laboratories’ Celexa and Lexapro and Abbott’s Depakote. Both the hypothyroidism and Non-24 unbranded ad campaigns are so general, they apply to almost everyone. They bring us closer to what comedian Chris Rock predicted drug advertising would become, in a TV special: “Do you fall asleep at night and wake up in the morning? You may be suffering from…”. Do You Have Undiagnosed Hypothyroidism? From Joan Lunden and Mike Piazza who sold Claritin to Dorothy Hamill and Bruce Jenner who sold Vioxx, celebrity drug advertising is often phenomenally successful. No wonder the drug company AbbVie has selected actress Sofia Vergara to lead its hypothyroidism campaign. “Emmy-nominated actress Sofia Vergara is helping to raise awareness about the importance of diagnosing and treating hypothyroidism,” read a press release last spring, “a thyroid condition that affects millions of Americans.” Her campaign, called “Follow the Script,” funded by AbbVie, “aims to educate individuals with hypothyroidism about the importance of being consistent with the treatment their doctor prescribes, and provides a ‘script’ to ensure they consistently receive the medication prescribed by their doctor when they visit the pharmacy.” Ka-ching. While hypothyroidism certainly exists (as do other kinds of thyroid disorders) Vergara’s campaign capitalizes on the gray areas in its diagnosis and the well-documented human tendency to self-diagnosis, by planting fear and doubt. For example, the AbbVie press release says, “Thyroid conditions affect an estimated 30 million individuals in the U.S.” and “one in every eight women will develop a thyroid condition in her lifetime.” Yet Harvard Health Publications at Harvard Medical School places the figure at 12 million. Commensurate with unbranded advertising a.k.a. “disease mongering” Vergara’s “Follow the Script” campaign website features “interactive polls, symptom and treatment information,” “stories and videos from other individuals with hypothyroidism,” and a chance for visitors to “share their own experiences.” In classic unbranded pill marketing, the site also provides “helpful ‘scripts’ for speaking with your doctor and pharmacist”–so patients don’t go all the way to the doctor and fail to ring the cash register. AbbVie was formed in early 2013 when Abbott, located near Chicago, split into two companies, with AbbVie to concentrate on the blockbuster Humira, which made it $2 billion in one quarter of 2013. But Synthroid, the thyroid supplement drug behind Vergara’s campaign, enjoyed almost 25 percent growth last year and accounted for $153 million during the same quarter. Synthroid is the nation’s leading thyroid supplement drug despite going off patent decade ago, because it is widely perceived as more stable than competitor and generic versions of the drug. Lest no potential customers miss the fact that hypothyroidism is an under diagnosed, underreported major health problem with barriers and stigmas to treatment, a “National Academy of Hypothyroidism” also now exists. The first thing visitors to the site will see is a slide of an overweight women on a scale with the brazen headline “Is Your Thyroid Making You Fat”? Visitors will also learn that hypothyroidism could be causing their stress, depression and chronic pain just as lack of hormones or antidepressants caused them ten years ago. There is even a perk for sufferers of hypothyroidism. The Academy tells them how to apply for disability benefits for their hypothyroidism. Just trying to help! This article was posted on Thursday, February 6th, 2014 at 1:30pm and is filed under Health/Medical, Pharmaceuticals.